Many settings for each of your audiences can be changed or edited, including audience name, opt-in settings, campaign defaults, subscription settings, and subscribe/unsubscribe notifications. In this article, you'll learn where to view certain audience settings and how to update them. To access your audience name and defaults, follow these steps. If you have more than one audience, click Switch audience and choose the one you want to work with. From this page, you can review and update many settings. When you're finished, click Save Audience And Campaign Defaults. To change the name of your audience, type the new name into the Audience name field and click Save at the end of the section. If you've included the name of your audience on your signup form, it will not automatically update when you change the audience name. To edit your signup form, use the Form Builder. 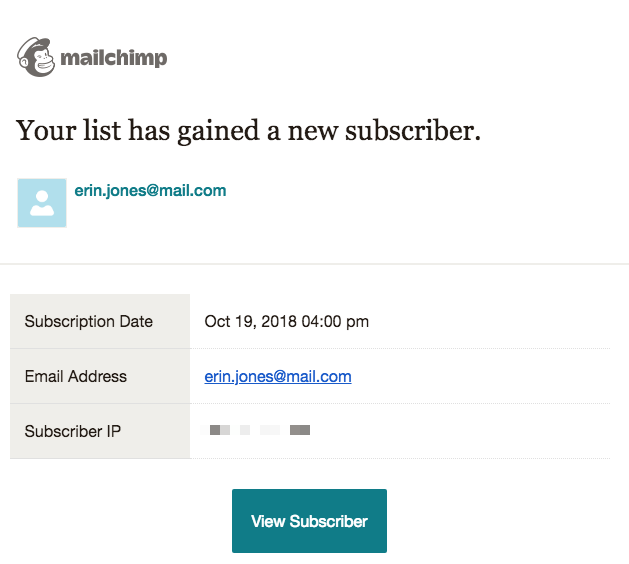 Each Mailchimp audience has an associated signup form, which you can share to grow your contacts. On the Audience name and defaults page, you can choose to enable double-opt-in, enable GDPR fields, or add reCAPTCHA confirmation to your embedded or pop-up form. (ReCAPTCHA is automatically included on our hosted, general forms.) If you want to customize your form's related pages and response emails, use the Form Builder. Forms use a signup method, like single opt-in or double opt-in, that determines what steps are taken before someone is added to your audience as a subscribed contact. Your audience is single opt-in by default. This means that when someone fills out your form, they’ll be added to your audience right away. Check the box next to Enable double opt-in to require contacts to verify their email address before they are added to your audience. Or, learn a little more about single opt-in vs. double opt-in. GDPR form fields are the first step in the process of GDPR compliance. These fields are added to your signup forms. They include checkboxes that your contacts will use to opt-in to your marketing, and space for you to add necessary information. Check the box next to Enable GDPR fields to collect consent with your signup forms, including embedded, hosted, pop-up and landing page forms. To prevent fake signups, we automatically add a special reCAPTCHA checkbox to your hosted signup forms that spambots can't access. If you use an embedded or pop-up form, you can check the box next to Enable reCAPTCHA to add it to your signup process. If your primary contact address is in the European Union, some of your audiences may be double opt-in by default. Find out which method you’re using on the Opt-In Settings page. Double opt-in can only be enabled for Mailchimp signup forms. If you need help with a form integration or the API, contact your developer, or hire a Mailchimp Expert. The content you enter here will appear automatically in the Campaign Builder each time you create a new campaign to send to this audience. 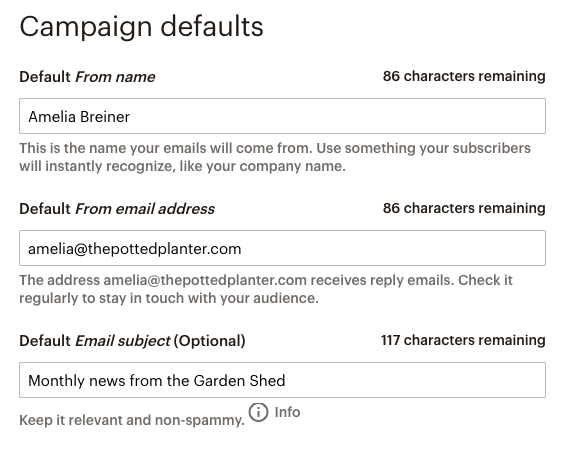 Defaults help maintain consistency among the email campaigns sent to a specific audience, but you can change that information for a single campaign in the Campaign Builder at any time. 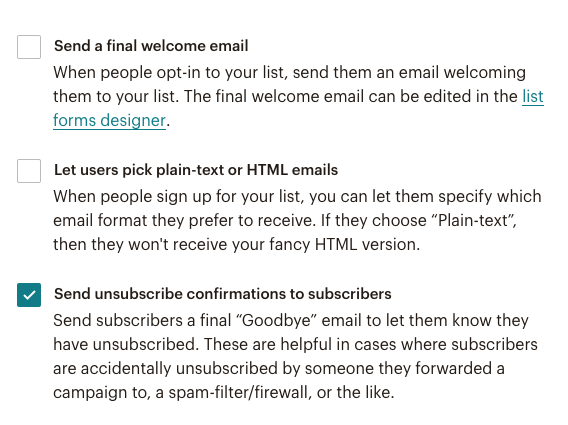 Under the Campaign defaults heading, choose how you want to interact with contacts when they subscribe or unsubscribe from your email marketing. Send a final welcome email Sends a welcome message to subscribers after they've confirmed their subscription to your email marketing. Imported and individually added subscribers don't receive this welcome email. You can customize the final welcome email in the Form Builder. Let users pick plain-text or HTML emails Adds an option for subscribers to choose what type of email they prefer to receive. This option is checked on by default. If you turn this option off, all subscribers will receive the HTML version. This setting can also be changed in the Form Builder. Send unsubscribe confirmations to subscribers Will send a "Goodbye" email to subscribers after the unsubscribe process is complete. This email is a helpful way to confirm the unsubscribe action, and provides an opportunity for the person to resubscribe if they've made a mistake. Some subscribers find these emails annoying, so it's up to you whether you include it. The "Goodbye" email can be edited in the Form Builder. Subscribe and unsubscribe notifications alert you when someone opts in or opts out of your email marketing. Under the New subscriber notifications heading, provide one or more email addresses to receive the notifications you're interested in. One by one notifications are sent each time a subscriber opts in or opts out, and Summary notifications condense activity into a single, daily digest email. You may provide email addresses for any, all, or none of the options. Separate multiple addresses with a comma, and note there is a 100-character limit for each field. Here is an example of an individual subscribe notification email. If you don't wish to receive these sort of notifications, leave the notification fields blank. If you have trouble receiving these notifications, check out our troubleshooting tips. Subscribe and unsubscribe notifications tell you when someone opts in or out of your email marketing. Learn how to disable or enable notifications.